York's key Ebor Festival races will be staged at other courses after the entire four-day programme was washed out, with the track waterlogged. With the first two days already lost, clerk of the course William Derby was forced to call off Thursday and Friday's action on Wednesday lunchtime. But Newmarket, Goodwood and Newbury have all stepped up to host races. Newbury will stage a replacement Ebor race on Friday, with the International Stakes at Newmarket on Saturday. Newmarket will also run two other Group One events - the Darley Yorkshire Oaks and the Coolmore Nunthorpe Stakes - on Friday. Goodwood hosts the Ladbrokes Great Voltigeur Stakes (a St Leger trial) on Saturday, while the Ebor will be replaced by the Totesport Newburgh Handicap - Newburgh being the original Norman name for Newbury. The Berkshire track is also offering free entry to anybody holding tickets to any of the four days of the York meeting. 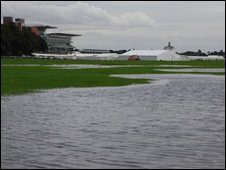 The rest of York's Ebor Festival has been cancelled after an inspection of the waterlogged course. The first two days were lost to the weather and on Wednesday clerk of the course William Derby had to assess the prospects for Thursday and Friday. Announcing the abandonment at York, Derby explained: "The track is waterlogged in places and there is no prospect of it drying out. "It is obviously disappointing for the connections of the horses and the whole team so I am so sorry about that." The meeting had been expected to attract 100,000 people over the four days, and he described the experience as "hugely frustrating" and "very humbling", but said the conditions were so bad he was left with no option. "We have had an unbelievable amount of rainfall and the course could just not take any more. "We had a shower this morning and that has just compounded the situation." The clash between King George winner Duke of Marmalade and Derby hero New Approach in the International Stakes was due to be the highlight of the festival. York chairman Nicholas Wrigley was quick to dispel rumours about their motivation for abandoning the meeting. "There is no financial incentive for us to abandon," he said. "We are here to race and we want to race, and in the sense that we are a not-for-profit organisation then the whole committee does want to race." Meanwhile, British Horseracing Authority director of communications John Ryan paid tribute to director of racing Ruth Quinn over the rescheduled races. "Ruth has performed minor miracles in getting this done at such short notice," he said. "A lot of the sponsors have been fantastic and the owners and trainers she has spoken to have, in the main, been incredibly helpful. "Out of the loss of a four-day meeting like this there are some wonderful positives to racing in terms of what people can do in a crisis, and this is a crisis."